Malt house flour is a wholemeal flour with the added flavour and goodness of cracked malted grains. These quantities will make one large loaf or two smaller ones – meaning you can freeze one for later. You could also try one of the flavour variations below. Lightly grease a 900g loaf tin or 2 small loaf tins (about 450-500g). Mix together the flour, yeast and salt in a large bowl. Make a well in the centre and pour in 375ml tepid water. Using a round-bladed knife, work the flour mixture into the water until it starts to form a dough. Use your hands to finish mixing, adding a little more water if the dough feels dry. Turn out onto a lightly floured surface and knead for about 10 minutes until the dough is smooth and elastic. Lightly oil a clean bowl and drop in the dough. Cover with clingfilm. Leave in a warm place for about an hour until doubled in size. Tip onto a floured work surface then, using your fist, 'punch' the dough to release the air. Shape into an oval. Place the dough in the tin, cover loosely with lightly oiled clingfilm and leave to rise again, for about 1 hour or until doubled in size. Towards the end of the proving time, preheat the oven to 220°C, gas mark 7. Dust the loaf with a little extra flour and, using a floured, sharp knife, score the surface several times to decorate. Bake for 25 minutes until risen and pale golden. To test whether the loaf is cooked, turn it out of the tin and tap the underside. It should sound hollow. If it doesn't, return the loaf to the oven on a baking sheet for a little longer. Cool on a wire rack. Seeded Bread Add 50g Waitrose Five Seed Mix (sunflower, pumpkin, linseed, hemp and pine nuts) to the dry ingredients. 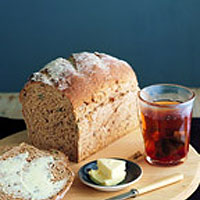 Walnut Bread Add 2 tablespoons clear honey with the water and 100g walnut pieces towards the end of kneading.